As April, Leo, Mike and Don transverse their cave, they discover half buried nuclear waste barrels. Raphael threatens the wolves, but quickly realizes that he should try to retreat. As the ninja backs away, he bumps his head on a stalactyte, which comes loose and conks him on the head, knocking him cold. At Mokoshan’s village, the king of the wolvf people explains how his society works to Ninjara. They have no contact with the outside world of modern man, and to surive in difficult times they maintain a heard of caribou in case they cannot hunt in the wild. Mokoshan also tells Ninjara that his people are known by the “ancient” men of the region, the Eskimoes, who came to this area centuries ago from Asia, as did the werewolves. Ninjara explains that her people are from Japan, and that she’s thinking about returning there. Mokoshan invites her stay with the wolves until she has fully recovered from her gun wounds – and on cue, Ninjara begins to feel faint. Mokoshan takes her back to her room. April and the guys emerge out the other side of their cave and discover some crazy plant growth. April explains that the government were experimenting with the nuclear waste, to see what its effects on the soil would be. As they walk away, Leo notes that if this is the result of the tests on plant life, he wouldn’t want to see what it would do to wildlife… and from the darkness of the cave, two very large eyes peer at the group. Raph awakes inside a room very similar to the one Ninjara is housed in. He’s greeted slyly by Revyen, but Raph is angry and jumps out of bed to search for Ninjara. Revyen points out a window, where Raph sees Mokoshan walking with the ninja, his arm around her. Raphael crashes through a window and accosts the werewolf. 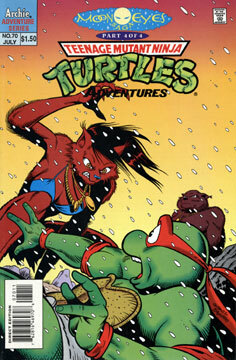 Mokoshan tries to talk with Raph, but the Turtle is too angry for words and he punches the wolf king. Ninjara cries for them to stop, but the boys continue their battle, as Revyen smiles from the window above. Meanwhile, the werebear is back, and it’s brought some friends to attack April, Don, Leo and Mike. Leo orders a hasty retreat as the group is no match for the monstrous bears. Raph and Mokoshan continue to fight, when suddenly Leo and the others burst through the trees, the werebears in hot pursuit. Mokoshan releases the caribou to divert the bears’ attention, and the plan works! The bears chase the caribou off into the distance. Mokoshan discovers Ninjara lying on the ground and rushes to her side. She weakly states that she’s okay, but the strain of the excitement was too much for her. Mokoshan lifts her and carries her to her room, as Raph stands dejectedly by the side. Later, Ninjara and April are seated on the mountains talking. Ninjara reveals that she plans to return home, although she does like Mokoshan’s village (as well as him). Raph arrives and asks April for some time alone with Ninjara. April vacates the are and Raph sits with Ninjara. Ninjara tells the turtle that there’s more to this problem than just them, but she does have needs that aren’t being met. She states that she needs some consistency and structure to her life – and she just wants out of the situation that she’s currently in. Raphael assures her that it’s okay, that hes seen this coming for a long time now, and that’s one reason he’s been so upset lately. He then tells her that he’ll miss her, and Ninjara says that she’llmiss him, too. “The I guess this is goodbye…” Raphael says as the two kiss. Raph walks off as Ninjara remains seated on the stones, both begin to cry. Below, Mokoshan bids the others farewell. Raphael joins them and the wolf king also says goodbye to him, but the ninja ignores Mokoshan. Mike tries to console his brother by telling him that “it’s better to have lost at love than never to have loved at all.” With a sour expression on his face, Raph tells Mike to shut-up. Our heroes walk off into the woods as the sun rises before them.